Know any young people who are starting to take an interest in the next federal election – or that you want to encourage to take an interest? 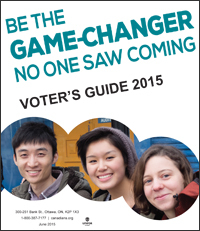 Nearly 2 out of 3 young people, ages 18 – 24, did not vote in the last federal election. Share this Voter’s Guide widely! This entry was posted in News and Events by riverside11. Bookmark the permalink.